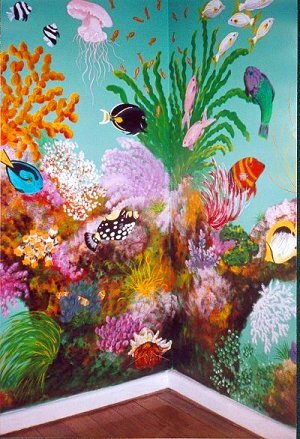 (Great Barrier Reef Mural Detail) October 2003 A very early commission, this time to decorate a young girl's bedroom in Tasmania. Luckily the existing wall colour worked in very well with the marine theme. The piece was challenging in a number of ways including low light conditions and equally low temperatures.